Informed Choice Radio is the personal finance podcast all about achieving your financial goals and living a better life. New episodes are published every Monday and Friday morning, featuring expert interviews and practical tips for making the most of your money. You’ll learn from best-selling authors, thought leaders and personal finance experts. 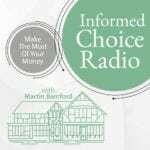 Your host for Informed Choice Radio is Martin Bamford; a Chartered Financial Planner, Fellow of the Personal Finance Society and personal finance author.